Head coach Alan Solomons hailed the impact of his replacements in a depleted squad as Edinburgh held on for a 24-23 Pro12 win over Scarlets. "That win was absolutely critical for us if we want to compete for a top six spot," he told BBC Scotland. "From our squad of 43 we had 18 guys gone, so strength in depth is vital. "All the players that came on made a difference and it speaks volumes that we can put out a competitive side under these circumstances." With a long injury list and players on Six Nations duty, things were looking gloomy for Edinburgh after an error-strewn opening at Murrayfield. Having lost their previous three matches, the hosts were trailing 23-16 at the interval. However, an unconverted Ben Toolis try 11 minutes from time added to Phil Burleigh's first-half touchdown, while Aled Thomas made a mess of a simple late penalty for the visitors. "We made it really difficult for ourselves, we gifted them their first 13 points," said Solomons. "We simply weren't at the races, we were too loose, and we had a few words at half time. I think I broke the rage-ometer! "But, second half, the players showed enormous resolve. They were not going to lose that game. "The energy we showed in the last 10 minutes was fantastic, we need to show that for 80 minutes." With Scotland ending their Six Nations drought in Italy, Solomons said it was "a great weekend for Scottish rugby", adding: "Our national team was superb, Glasgow got an important win and the Under-20s won. "We are definitely moving in the right direction in this country." 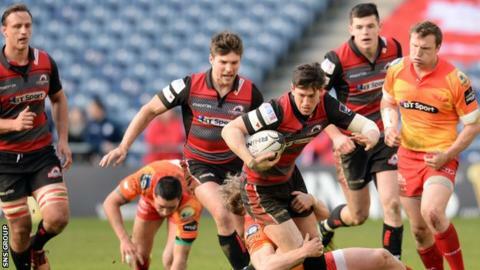 Edinburgh move up to fifth in the table and host leaders Connacht on Friday. Looking forward to the next fixture, Solomons said his squad would need "a massive performance". He added: "We get a 10-day break afterwards, so we don't want to leave anything out on the field."